A 42-year-old woman presented with hyperpigmentation and nodules on her face for the past three months. Her past medical history was significant for primary hypertension, stroke at a young age and seizures. Her medications included aspirin 75 mg/day, clopidogrel 75 mg/day, phenytoin 200 mg/day, rosuvastatin 5 mg/day, piracetam 800 mg/day and telmisartan 20 mg/day, all of which she had been taking for the past five years. All lab testing including blood count, renal and liver function and thyroid profile were found to be within normal limits. 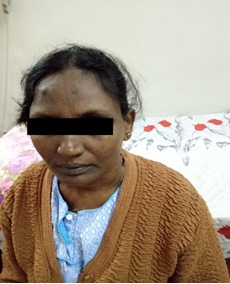 On examination she had dark brown patches on her forehead, cheeks and on her neck (Figure 1). Nodular lesions were seen below the mandible and on forehead (Figure 1). MCQ 1: Which is most likely medication to cause hyperpigmentation?